Every day in the United States, more than 150 people suffer from traumatic brain injury (TBI). The effects of this debilitating injury can last several weeks or, in more serious cases, leave victims with permanent impairments for the rest of their lives. Trauma to neurological cells creates chemical changes in the brain leading to nerve damage, memory loss, behavioral changes, seizures, coma and other life-altering conditions. In the wake of such a devastating diagnosis, families may find themselves overwhelmed with medical expenses, insurance paperwork and hospital visits – all while trying to deal with the emotional hardships of caring for a loved one. Because the effects of a TBI can permanently disrupt a person’s quality of life, their ability to work and support a family, those who were injured because of another party’s negligence are entitled to file a claim for damages. 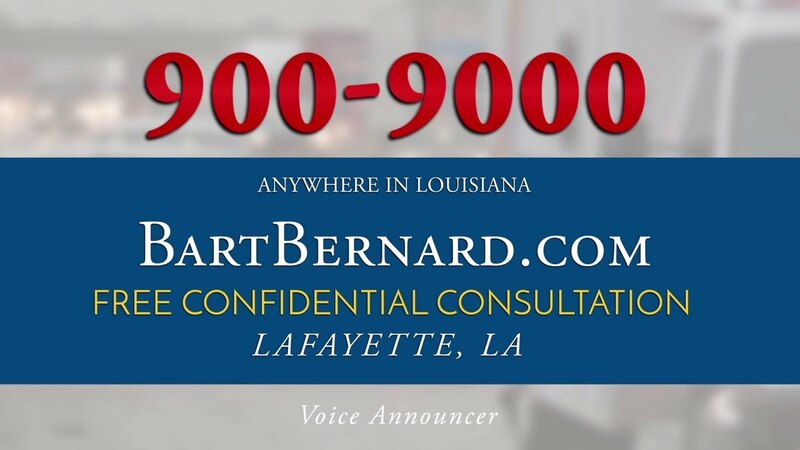 Bart Bernard is a highly credentialed traumatic brain injury lawyer in Louisiana who welcomes the chance to provide expert legal guidance to injury victims. A successful personal injury claim can seek monetary damages for a variety of losses including past and future medical bills, occupational therapy costs, lost income, loss of future earning capacity, pain and emotional suffering, loss of consortium, among other damages. Bart Bernard has more than two decades of experience handling claims on behalf of Louisiana residents whose lives have been upended due to traumatic brain injury caused by vehicle crashes, falls, and workplace accidents. If you or someone you love was diagnosed with a TBI and has questions about liability, we invite you to contact traumatic brain injury attorney Bart Bernard for a complimentary consultation. Utilizing his vast knowledge of personal injury law, Bart can quickly assess if you have a viable claim for compensation in Louisiana. Caused by a substantial blow or trauma to the head, a TBI can be characterized by open or closed head injuries. Traumatic brain injury may be classified as “mild” – such as a concussion—or “severe.” Some studies suggest that whiplash, which is often experienced in rear-end collisions, can also lead to TBI, as the brain is jolted violently back in forth against the skull. Even those who have suffered a mild to moderate TBI can expect an uphill battle to regain a sense of normalcy in their lives. Without the means to cover hospital and rehabilitation costs, victims may be pushed to the brink of bankruptcy, which is why it’s imperative to have veteran legal counsel protecting your rights. Bart Bernard knows how to maximize the value of your case, and will fight to make sure you get the compensation you need and deserve from negligent parties. Is traumatic brain injury permanent? According to Mayo Clinic, a severe TBI can cause permanent changes to the victim’s state of awareness, consciousness, and responsiveness. The Brain Injury Association states that persons with a moderate TBI can generally make a good recovery and learn to compensate for any cognitive or physical impairments sustained. Although younger people tend to recover more rapidly from a TBI, it may still be a life-long process of treatment and rehabilitation. TBI treatments are designed to help victims cope with a host of impairments including motor deficits, cognitive deficits, sensory deficits, social difficulties and functional deficits. Treatments may entail a number of modalities, surgery and medication aimed at stabilizing the brain and helping victims regain their independence. TBI treatment and recovery can be a costly endeavor, utilizing a team of neurosurgeons, psychiatrists, internists, physical and occupational therapists, dieticians and other health care professionals. Unfortunately, research has demonstrated that repeated injury to the brain, in the form of a contusion or concussion, is linked to an increased risk of severe depression, Alzheimer’s disease and other forms of dementia. As an experienced traumatic brain injury atttorney, Bart Bernard understands the profound impacts of this trauma, which can have a dramatic effect on all facets of the victim’s life. Attorney Bart Bernard takes pride in offering his personal injury clients attentive, personalized service through every step of the litigation process. His talented staff includes skilled investigators, accident reconstruction specialists and medical experts. To schedule a free, no-obligation case review with a traumatic brain injury lawyer who gets results, we invite you to call or stop by our Lafayette or Baton Rouge offices.